A Colorado history professor who allegedly forced his students to recite an anti-American pledge in class has been cleared of any wrongdoing after a student filed a complaint of partisan bias with the university. 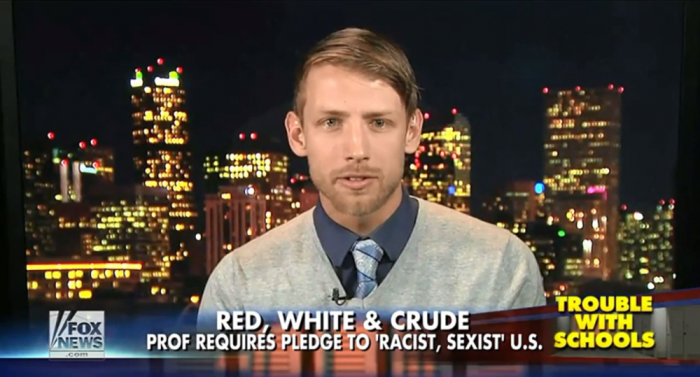 Charles Angeletti, who teaches at Metropolitan State University of Denver, was accused of poor conduct in the classroom after gaining national headlines for requiring his students to say an anti-American version of the Pledge of Allegiance. Last month Caleb Bonham, editor in chief at the online publication Campus Reform, wrote an article spotlighting allegations of extreme liberal bias by Angeletti in his pledge. According to Bonham's article, the mock pledge reads as follows: "I pledge allegiance to and wrap myself in the flag of the United States Against Anything Un-American and to the Republicans for which it stands, two nations, under Jesus, rich against poor, with curtailed liberty and justice for all except blacks, homosexuals, women who want abortions, Communists, welfare queens, treehuggers, feminazis, illegal immigrants, children of illegal immigrants, and you if you don't watch your step." The Campus Reform article spread wildly on the Internet and pushed for MSU officials to investigate the allegations leveled by his source, student Steven Farr. In a statement recently released by MSU, the university said they investigated accusations against Angeletti and found no evidence of wrongdoing. While Angeletti doesn't deny handing out copies of the mock pledge, he argues that it was supposed to be provocative and create discussion rather than indoctrinate. In MSU's statement released last month, the university said: "Angeletti confirmed that he has been using the anti-pledge in his course for more than 20 years, and that he provides a 'critical approach' handout on the first day of class that asks students to list 10 reasons 'why I am proud to be an American' and 10 reasons 'why I am not proud to be an American.' ... Angeletti confirmed that the anti-pledge was intended to be proactive and spark dialogue in the classroom." "To date, no student has submitted a complaint. In general students were complimentary of Angeletti as a professor. All but [MSU student Steven Farr] said he encouraged open dialogue and differing opinions in the classroom," the statement continued. "The university concludes there was no violation of the students' First Amendment rights, and that the faculty member exercised his right to academic freedom, and considers this matter closed." MSU also noted the university had interviewed Farr, various students who took Angeletti's class over the years, as well as Angeletti as part of their investigation. "Farr was the only one who cited Angeletti's teaching methods as the reason for dropping the course." "The university concludes there was no violation of the students' First Amendment rights, and that the faculty member exercised his right to academic freedom, and considers this matter closed," the statement ended. Angeletti, who's taught at MSU of Denver for more than four decades, has a polarizing impression among his former students. In a 2010 article written by Jamie Cotten for My Met Media, Angeletti was said to be a self-described "cynic, socialist, atheist and No. 1 admirer of the-late Howard Zinn."